Okay, kids...we didn't want to leave you out! Even though there are many recipes and crafts that you can make with Mom and Dad, we decided to add a few more just for kids. (Even though you might need Mom and Dad to help.) Sometimes it is fun to make gifts for Mom and Dad! 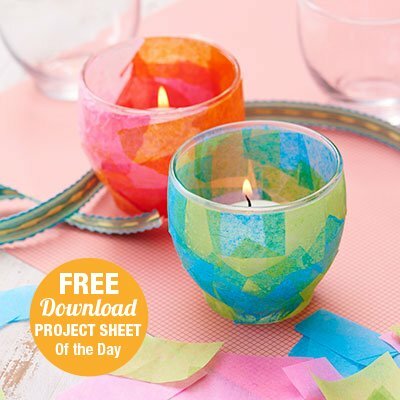 Try the Tissue Paper Candle Holders. 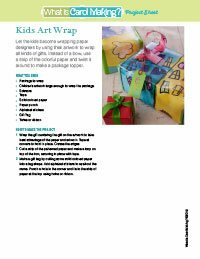 Use your artwork to wrap packages! What a creative artist you are! 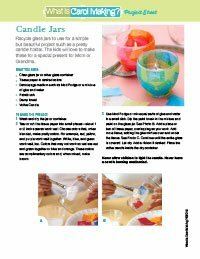 Recycle glass jars to use for a simple but beautiful project such as a pretty candle holder. 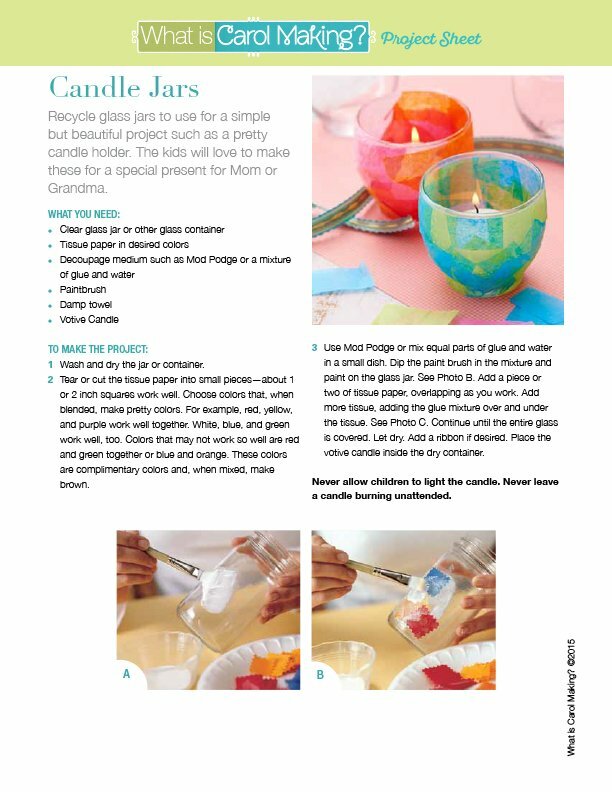 The kids will love to make these for a special present for Mom or Grandma. No matter what shapes the tissue paper is torn or cut into, the overlapping makes it a pretty design. (Note: Never let children light candles.) Download the Project Sheet at the top of this page for instructions. 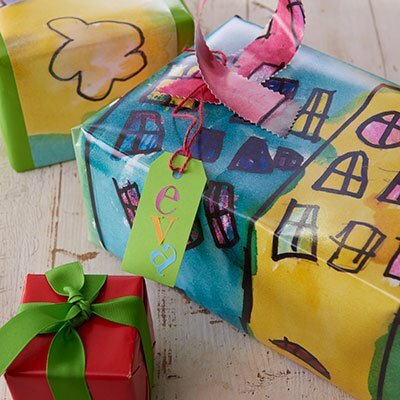 Let the kids become wrapping paper designers by using their artwork to wrap all kinds of gifts. Instead of a bow, use a strip of the colorful paper and twist it around to make a package topper. Download the Project Sheet at the top of this page for instructions. 1 Wrap the gift centering the gift on the artwork to take best advantage of the paper and artwork. Tape at corners to hold in place. Crease the edges. 2 Cut a strip of the patterned paper and make a loop on top of the box, securing in place with tape. 3 Make a gift tag by cutting some solid-colored paper into a tag shape. Add alphabet stickers to spell out the name. Punch a hole in the corner and tie to the strip of paper at the top using twine or ribbon. Everyone loves to wear bracelets and especially when it spells out a name! 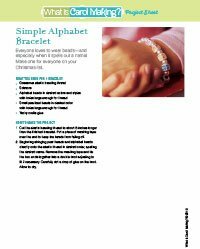 This bracelet is easy to make using elastic bead cording. Download the Project Sheet at the top of this page for instructions. 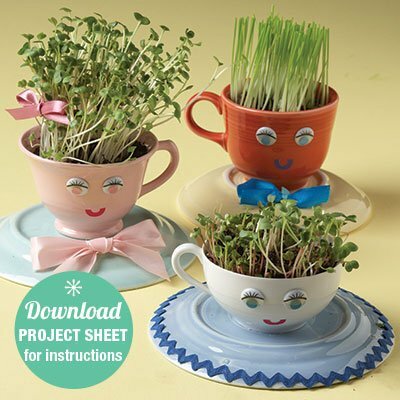 Who would of thought you could make your own version of a Chia Pet? 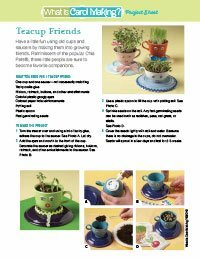 You'll love these teacup friends! For instructions, download the Project Sheet, above.